An oil pressure relief device is fitted at the top of the transformer tank. In its simplest form, it is a frangible disc located at the end of an oil relief pipe protruding from the top of the transformer tank. In case of a serious fault, a surge in the oil is developed, which busts the disc, thereby allowing the oil to discharge rapidly. This avoids the explosive rupture of the tank and the risk of fire. The drawback of the frangible disc is that the oil which remains in the tank after rupture is left exposed to the atmosphere. 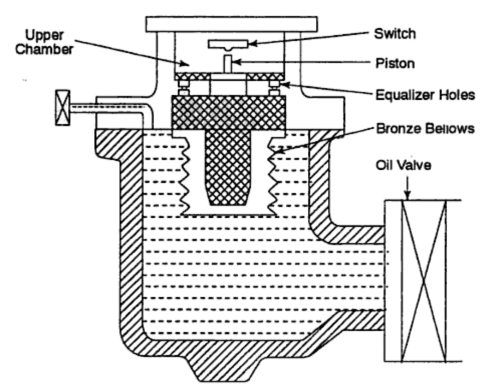 This drawback can be overcome by employing a more effective device : a spring controlled pressure relief valve. It operates when the pressure exceeds 10 psi but closes automatically when the pressure falls below the electrical level. The discharge oil can be ducted to a catchment pit where random discharge of oil is to be avoided. The device is commonly employed for large power transformers of the rating 2 MVA and above but it can also be used for distribution transformers of 200 KVA and above. This device is capable of detecting a rapid rise of pressure, rather than absolute pressure. Its operation is quicker than the pressure relief valve. It is employed in transformers which are provided with gas cushions instead of conservators. Fig. 1 shows a modern sudden pressure relay which contains a metallic bellows full of silicone oil. The bellows is placed in the transformer oil. The relay is placed at the bottom of the tank where maintenance jobs can be performed conveniently. It operates on the principle of rate of increase of pressure. It is usually designed to trip the transformer.